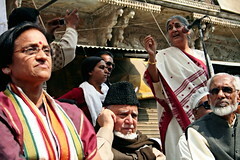 Although Rita Joshi Bahuguna got interim bail on Saturday but that also bring the fresh perspective about the language used by our leaders, we often hear now and then these kinds of statements specially from political leaders during election rally but then every other party leader were making such statements and also backtrack from their statements even though there statement were caught on tape by audio visual media. Whether it's case of Varun Gandhi, Mayawati, Lalu Prasad, Narendra Modi or even Sonia Gandhi making such statements which are in no way reflect the Indian culture but as the TINA (There Is No Alternative) factor works for them and we are forced to elect among them only and result is that Assembly and Parliament become battleground and in name of privilege the members can speak whatever they can without fear and sometimes not spare even the lifeless things like mikes, desks and chairs and use them for the purpose that is not what these things are supposed to be used. Anyway we expect our representatives to mature and use the public platform for the welfare for common man and not to stall the debate and healthy discussion in the house. Recent events in the Rajasthan assembly is also one another example where the house remain disturbed due to making of some untoward statement by very senior leaders of the house and thus CM has forced to submit his reply on budget discussion on the table of the house and so the common man loose the insight into the reply. Common man has either have very short memory or it have no alternative to look into these issues when they cast their votes otherwise the representative will think twice before taking any such action. Politicians must be aware of the fact that words released from mouth will not come back and millions of people were listening them so they must have some sort of control on their tongue that will be helpful to them and also to the country otherwise one would know the fate of one of the recently appointed Governor who dared to speak and open mouth and now pay the price by getting sidetracked from active politics.